Ronan Volunteer Fire Department Sgt. Chris Atkinson and Assistant Fire Chief Dave Marmon wait for a wrecker to pull a car from the canal at Terrace Lake Road last Thursday. RONAN — A report of a car in the canal sent emergency crews rushing to the corner of Terrace Lake Road and Timberlane Road just before noon on Thursday. 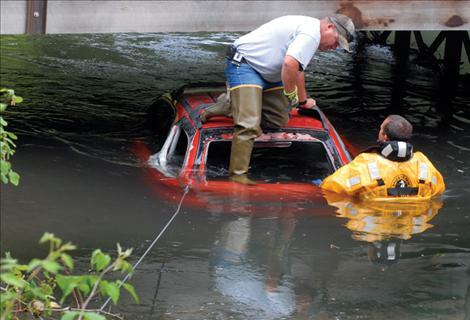 Responders found a small red Subaru nearly submerged under the Terrace Lake bridge. Ronan volunteer firefighters secured the vehicle before searching the interior and determining that no one was inside. Lake County Sheriff Deputies also walked down the canal but found no one around. Although the car was registered to Sarah Miller, a friend, Edie Avendano, had borrowed it that night. Avendano did not attempt to report the wreck, and instead walked to her mother’s home. Avendano showed up at St. Luke hospital about 6 p.m. Thursday, “pretty banged up,” according to Montana Highway Patrol trooper Chad Anderson. Avendano was charged with reckless driving, failure to report the wreck, driving with an expired driver’s license, no seatbelt, and obstructing a peace officer, according to Anderson. Anderson said there was evidence that speed and alcohol were both factors in the crash, which happened shortly after midnight Thursday. Avendano told Anderson that she swerved to avoid hitting a deer, “but the skid marks suggest otherwise,” Anderson said. Losing her car in the wreck just added more pain to an already stressful week, Miller said. The family had just buried a loved one on Saturday. An all-you-can-eat Indian taco fundraiser will help the Miller family pay for funeral expenses, and will be held Friday, Aug. 10 at the Tribal Senior Center. The taco feed begins at 4 p.m.